» Gleim CIA Review Discount Code April 2019: Save 20%! Loading... Looking for the best Gleim CIA Review discount? The team at Gleim CIA Review has shared an exclusive discount for our readers. This discount guarantees you to save on either Gleim Premium CIA Review, Gleim Books and Test Bank or both! Disclosure: The I Pass Team may earn a small amount of compensation if you purchase from our links; however, our team uses these revenues to maintain the site and produce awesome free content just for you! The Gleim CIA Review discount auto-applies to your cart – no promo code required. But you must checkout online using the links above to activate the discount. Is Gleim CIA Review the Best CIA Course for You? Save 20% on Gleim CIA Now! Where Do You Enter the Gleim CIA Promo Code on the Gleim Shopping Cart? So, I have great news! The Gleim shopping cart doesn’t actually require a promo code at all. Instead of using a promo code system, Gleim embeds the discounts in all their links. Therefore, all you need to do in order to save on Gleim CIA is use the links I have provided. Then, simply add a valid product to your shopping cart and the savings will automatically be applied. All of the very best Gleim discounts can be found below. If you have ANY problems using the Gleim discounts, contact me right away. I am happy to help! Save 20% on the 3-part Gleim CIA Premium Course. Save 15% on the 3-part Gleim CIA test bank. Is Gleim CIA Worth It? Find out why Gleim CIA is the BEST CIA review course. Save 20% on the 2-part Gleim CMA Premium Course. 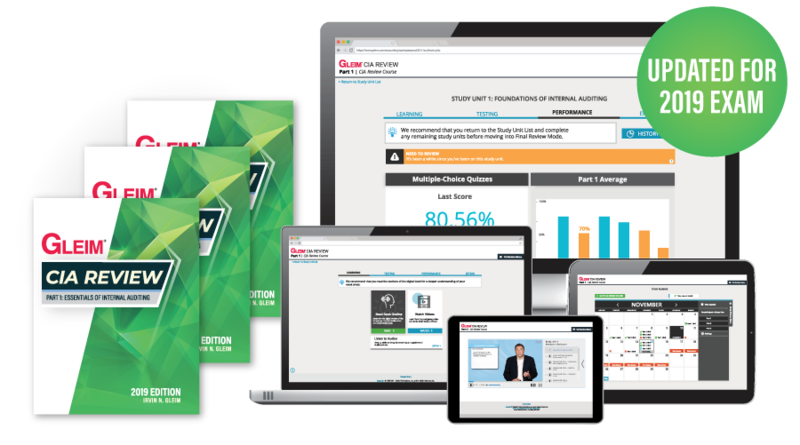 Save 20% on individual parts of the Gleim CMA Premium Course. Save 10% on the 2-part Gleim CMA Test Bank. Find everything you need to know about Gleim CMA. Save 15% on the 4-section Gleim CPA Premium Course. Save 20% on individual sections of the Gleim CPA Premium Course. Save 50% on the 4-section Gleim Mega Test Bank. Learn more about Gleim CPA. Save 15% on the 3-part Gleim EA Premium Course. Save 10% on individual parts of the Gleim EA Premium Course. Learn how Gleim EA stacks up. I Pass the CIA Exam is THE place to find Gleim CIA test bank discounts and Gleim CIA course discounts. We have more information about Gleim in our thorough CIA review, and if you’re curious how Gleim stacks up, check out our chart of the best CIA courses. If you’ve used Gleim to pass the CIA exam, leave a comment and let us know if it helped you. We’d love to hear your feedback on this course! Feel free to reach out if you need any assistance from our team! Or follow us on Quora! Accountant and blogger - I love to help you pass your exams! Hello! I just passed part 1 of the CIA exam using the Gleim test bank and book and it worked great for me. I was trying to use the 15% code you offer to get part 2, but noticed it only works for the entire package. Is there a discount code for the individual parts? Thanks! Hello, unfortunately there isn’t one for individual parts. Gleim rarely discounts individual parts. Here’s where you can find the Gleim CIA discount. Also, we may be able to help you save even without the 15% discount, so if you need help with that, please email stephanie at ipasstheciaexam dot com.